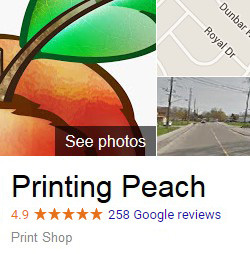 We do more printing for clients in the Toronto area than anywhere else in Canada. Although we are a web-based business, we do have an office in Burlington where local clients can pick up the majority of their orders if they want to avoid shipping expense which makes sense especially for larger orders. Of course, if it's more convenient, we can certainly ship orders to you in the Toronto area. We print a wide variety of marketing materials including flyers, business cards, postcards, brochures, door hangers, notepads, booklets and more.